100th Anniversary Screening of the original Sherlock Holmes film - right in the room where they shot it! Right: A publicity still of Sherlock Holmes in the July 1916 edition of Moving Picture World, an early trade journal for the American film industry. A publicity still of Sherlock Holmes in the July 1916 edition of Moving Picture World, an early trade journal for the American film industry. For a brief period when Hollywood was just a bunch of orange trees, Chicago was the center of the filmmaking world. 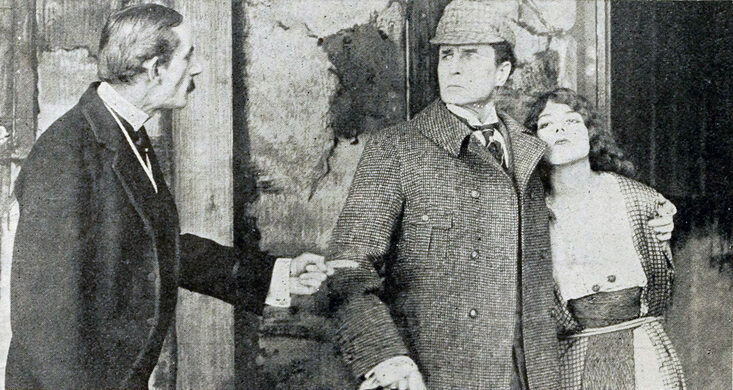 Essanay Studios was cranking out several silent films per month, including the very first Sherlock Holmes film, starring William Gillette, in 1916. Thought to be lost forever, a new print was discovered in 2014, and we'll be screening it right in the old studio where it was filmed! The old Essanay stage is now a part of St. Augustine College on West Argyle. Dress in your Sherlockian best and come back in time with us. The evening will feature a short piece on Essanay history from Flickering Empire: How Chicago Invented the U.S. Film Industry author Adam Selzer and the film will be musically accompanied by local talent Lelya Bauer and Matt Griffo. Throughout the evening enjoy a cash bar of special Sherlock-themed cocktails (pipe tobacco infused spirits, anyone?) crafted by Knife & Tine's mixologist Nikki Allen.